If you are planning on buying a home in 2015, you should expect to see fewer distressed properties for sale than the market has offered during the past five years. As home values complete a second year of appreciation, more and more home sellers now have the equity to resolve the issues that were previously pushing past homeowners towards short sales and foreclosures. So prepare for a market where the offerings are (for the most part) in better condition than what we've seen in the past few years and well-priced home sellers who are able to find multiple buyers for their homes. 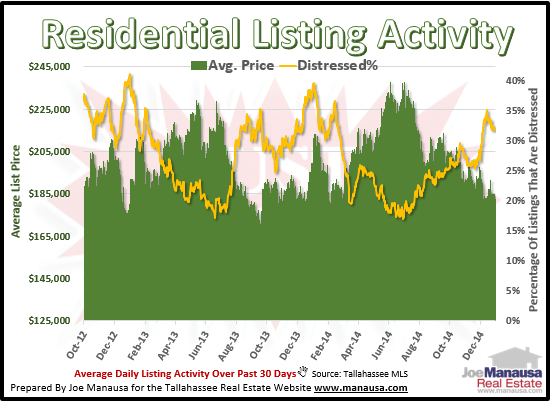 Each of the past few years has shown a consistent trend, where the ratio of distressed properties listed for sale in the Tallahassee MLS rises to a peak at the end of December or within the first few days of January. But this year the trend ended sooner and lower. The real estate graph above shows a short term trend of two important measurements for new inventory. The green bars show the 30 day trend (average) of the average list price of homes entering the market, while the gold line shows the 30 day trend of the percentage of new listings that are distressed. It is this gold line that reveals the important change. At the end of 2012 (specifically 12/31/2012), 41% of the listings entering the market over the 30 previous days were distressed properties. At the end of 2013 (specifically 1/2/2014), 39.5% of the listings entering the market over the 30 previous days were distressed properties. At the end of 2014 (specifically 12/13/2014), 35.1% of the listings entering the market over the 30 previous days were distressed properties. The peak came sooner and the ratio was significantly lower than the previous two years. So what does this mean? I believe it is a sign of the market getting healthier. During the first 15 years of my 23+ year career, I did not measure the ratio of distressed properties in the market, but I suspect it rarely reached as high as 5% of the new listings entering the market. Therefore, when all the dust finally settles from the housing market collapse of 8 years ago, I think the Tallahassee real estate market will return to these traditional levels. We are still far from "normal," but the decline in new distressed properties is a very good sign for everybody who cares about the health and well being of the Tallahassee housing market.